As promised when I canceled my mailing list this past week, I am going to post here when there's something new going on, business-wise. I will try to make sure you're aware of this in my title, so you don't have to waste your eyesight or time reading about things that don't interest you. 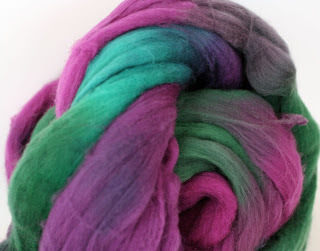 As of today, I have photographed and edited photos on roughly half my own handspun inventory, as well as some other "destash" yarns at ridiculously low prices. I am getting ready to start posting some of those items now to my Etsy shop. It's 6:15 MST...give me about 30 minutes before you start seeing new listings. Here's an idea I had this afternoon: certain products that I am destashing will have special offers included in the item description...most likely reduced or free shipping (within the U.S. only, sorry) depending on the item...so take a second look when you're cruising the shop...you may find something you can't pass up. Tonight I will list a few of my own handspun yarns, some destash roving, and some destash yarns. I will continue to post all that I have photographed these last two days over the next week...so check back once in a while!